Anticoagulation is the first-line therapy for all forms of pulmonary embolism. Systemic thrombolysis is also effective for those pulmonary embolism patients with shock, but it comes at a cost of increased bleeding ( http://www.ncbi.nlm.nih.gov/pubmed/15262836). There is less certainty regarding the optimal treatment for patients with submassive pulmonary embolism, defined as the subset of patients that are hemodynamically stable with evidence of right heart strain. Several trials seeking to add clarity for this “gray zone” have been recently published. A 47 year-old male with no medical history presented with dyspnea and pleuritic chest pain to a local ER. His blood pressure was 135/60, heart rate was 108 bpm, and his oxygen saturation was 94% on 2L oxygen per nasal cannula. He has recently been on a 12 hour transatlantic flight for business. 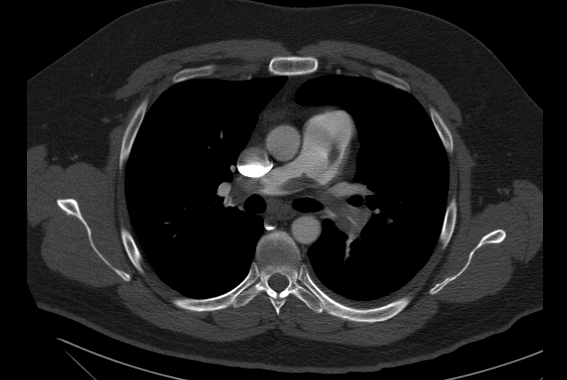 A CT showed bilateral main pulmonary artery embolism. His troponin was mildly elevated, and echocardiography revealed right heart strain. You reviewed treatment options with him, and elected to proceed with catheter-directed thrombolysis . Based on recent randomized controlled data, which of the following has not been demonstrated with the use of systemic or catheter-direced thrombolysis for PE? Two trials examining systemic, full-dose thrombolysis for submassive pulmonary embolism have been recently reported. In PEITHO (http://www.ncbi.nlm.nih.gov/pubmed/24716681), patients were randomized to anticoagulation versus anticoagulation plus tenecteplase. The primary endpoint, death or hemodynamic collapse at 7 days, was significantly reduced in the tenecteplase group (2.6% vs. 5.6%, P=0.02). This benefit was driven by a reduction in hemodynamic collapse but not mortality, and bleeding risk was higher in the tenecteplase group including intracranial hemorrhage (hemorrhagic strokes- 10 vs. 1). Subgroup analysis demonstrated that patients TOPCOAT (http://www.ncbi.nlm.nih.gov/pubmed/24484241) randomized patients to anticoagulation versus anticoagulation plus tenecteplase. The primary endpoint was a composite of: in-hospital death, clinical deterioration, or bleeding or poor quality-of-life, reduced functional capacity, or recurrent pulmonary embolism at 90 days. The primary endpoint was significantly reduced in the tenecteplase group (15% vs. 37%, P=0.02), with the bulk of the benefit being driven by improvements in functional capacity or health perception of patients. This trial was terminated prematurely due to funding issues after randomizing approximately half of the intended sample size. Higher rates of bleeding have been reported with systemic thrombolysis in large pulmonary embolism trials. Catheter-directed thrombolysis may be theoretically advantageous since much lower doses of thrombolytics may be administered to achieve the same therapeutic effect, and catheter-directed delivery may allow for higher concentrations of drug to associate with thrombus leading to faster clot dissolution. ULTIMA (http://www.ncbi.nlm.nih.gov/pubmed/24226805) randomized patients with submassive pulmonary embolism to anticoagulation versus anticoagulation plus catheter-directed thrombolysis. The primary endpoint was the change in right ventricle to left ventricle ratio (marker of right heart strain) at 24 hours following initiation of therapy. Catheter-directed thrombolysis was effective in reducing the primary endpoint, but clinical outcomes including mortality and recurrent venous thromboembolism were similar at 90 days. Bleeding was non-significantly higher in the catheter-directed thrombolysis group. SEATTLE II was a single arm prospective trial of ultrasound assisted lysis for submassive pulmonary embolism (Piazza G. A Prospective, single-arm, multicenter trial of ultrasound-facilitated, low-dose fibrinolysis for acute massive and submassive pulmonary embolism (SEATTLE II). Program and abstracts of the American College of Cardiology Scientific Session; March 29-31, 2014; Washington, DC. Late-breaking clinical trial). The preliminary presented results of this study showed a similar safety profile as the ULTIMA study had, and again similar efficacy as far as surrogates to patient status including right ventricular size and pulmonary arterial pressure improvement. Several recent meta-analyses including one published in JAMA by a group led by Dr. Jay Giri (http://www.ncbi.nlm.nih.gov/pubmed/24938564) included many of the aforementioned studies and came to the conclusion that thrombolysis resulted in improved patient outcome after submassive PE, however at the price of increased risk of major bleeding. Two main limitations of these analyses were that they mixed systemic and catheter directed data and that net-clinical benefit was highly dependent on the weight placed on intracranial hemorrhage. Of the choices listed, answer #4 is correct. PEITHO demonstrated a reduced risk or death or hemodymamic collapse at 7 days with use of systemic thrombolysis for intermediate-risk PE. MOPETT demonstrated improved quality-of-life measures for patients treated with “safe dose” thrombolytics.ULTIMA demonstrated that catheter-directed thrombolysis improves right ventricular function, as assessed by a surrogate marker of right heart strain (RV/LV ratio). The literature to date has yet to demonstrate reductions in hard cardiovascular enpoints including mortality or recurrent venous thromboembolism, though such data may be forthcoming through additional trials or longer term follow up of those already published. Pending the arrival of such data, the decision to use catheter-directed thrombolysis should be individualized, with an open acknowledgment of the current evidence gaps.